Dinah Pete of the Washoe Tribe of Nevada and California delivers a blessing. The 7,100-square foot museum is scheduled to open in the spring of 2019. It will occupy the school’s former administration building and its purpose it to tell the unvarnished history of the school, which opened in 1890 with 37 students from the Washoe, Paiute and Shoshone tribes. 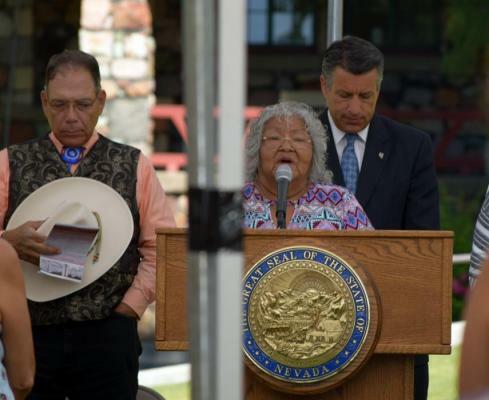 In the first photo: Dinah Pete of the Washoe Tribe of Nevada and California delivers a blessing for the construction of the Stewart Indian School Cultural Center and Museum, which is expected to be opening in the spring of 2019. Behind her is Nevada Gov. Brian Sandoval. Also pictured is Nevada Indian Commission Chairman Richard Arnold. 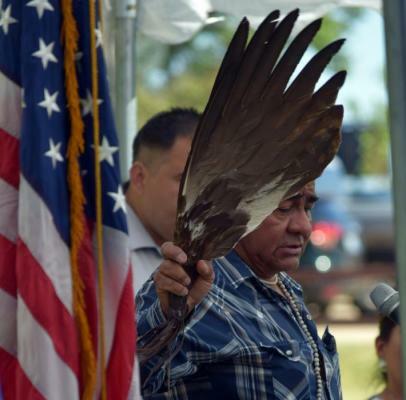 Reg Soap of the Duck Valley Shoshone-Paiute Indian Tribe delivers a blessing for the construction of the Stewart Indian School Cultural Center and Museum, which is expected to be opening in the spring of 2019.